For other people named Judith of Bavaria, see Judith of Bavaria (disambiguation). 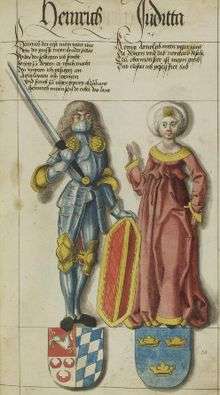 Judith (925 – soon after 29 June 985), was a Duchess consort of Bavaria, and Regent of Bavaria during the minority of her son Henry the Wrangler of Bavaria. She was the eldest daughter of Arnulf the Bad of Bavaria and traditionally Judith of Friuli, although modern scholars point to Judith of Sulichgau. She married Henry I of Bavaria, and through this marriage the Duchy of Bavaria entered the growing Kingdom of Germany. Their son was Henry the Wrangler, for whom she acted as regent after Henry's death in 955. She made a pilgrimage to Jerusalem and, upon returning in 974, retired to the Niedermünster in Regensburg, where she is buried beside her husband. Their other son, Brunon, Count of Brunswick, married and had descendants. Alois Schmid: Herzogin Judith von Bayern. In: Zeitschrift für Bayerische Landesgeschichte 76 (2013), S. 389-406.